What it’s about: There have been numerous macabre stories of bodies washing up on the shores of any number of bodies of water over the years. But by far the strangest happened in the Salish Sea—the network of waterways between northwest Washington state and southwest British Columbia that includes Puget Sound. Over the past nine years, numerous disembodied human feet have been found along both the American and Canadian sides of the sea (Wikipedia says 16, but lists 17). While theories abound, and a few feet’s owners have been identified, no one has any clear idea where the feet are coming from, or what happened to the bodies they were once attached to. Strangest fact: Nearly all of the feet were wearing shoes. While most of them are a mix of Nike, New Balance, and hiking boots, the first foot discovered, in August 2007, was wearing an Adidas running shoe distributed mainly in India. Also strange, while feet have continued to wash up as recently as this February, most of the shoes were made in 2004 or earlier. As a result, there’s an (unconfirmed) theory that the feet’s owners died in the Indian Ocean tsunami in December of that year and floated across the entire Pacific. Because the ankle is relatively narrow and weak, feet can be easily separated from a decomposing body and float up to 1,000 miles. Biggest controversy: Finding a foot and not finding a corresponding body nearby is rare. Finding two unrelated feet in a short span, in the same general area “has been given a ‘million to one odds,’” in Wikipedia’s not-terribly-grammatical opinion. After the fourth or fifth discovery, it was clear there was something at work beyond random chance, but it still isn’t clear what. Newspapers have been covering the story for several years; Norwegian cop-turned-novelist Jørn Lier Horst ripped a detective novel from the Salish Sea headlines in 2011, and even David Letterman investigated, asking two Canadian audience members for information. Thing we were unhappiest to learn: As if real feet washing up weren’t bad enough, someone out there was sick enough to plant hoax feet. In June 2008, remains found on Vancouver Island turned out to be a “skeletonized animal paw” put into a sock and shoe. And in 2011, several sneakers containing “what police suspected was raw meat” washed up on Oak Bay Beach, British Columbia. Also noteworthy: Puncturing the tsunami theory is the fact that some of the feet have been identified. The very first one discovered belonged to a missing man suffering from depression; the third belonged to a British Columbian who had gone missing four years earlier, though his death was not considered suspicious (i.e., accident or suicide). Two feet found six months apart in 2008 both belonged to a woman who jumped from the Pattullo Bridge in 2004, leading to another theory that all of the feet belong to suicides from that same bridge. Best link to elsewhere on Wikipedia: The aforementioned hoaxes were investigated by the Royal Canadian Mounted Police, as the perpetrators could face criminal charges. While the Mounties have long been one of the most visible symbols of Canadian culture, the popular image of the straightlaced, red-jacketed horseman who “always gets his man” is a far cry from the modern RCMP. Today the Mounties serve as Canada’s equivalent to both the FBI and Secret Service, while also providing basic law enforcement to any part of the country without a municipal police force. The Mounties have also trained police forces in Haiti, Iraq, and elsewhere around the world. 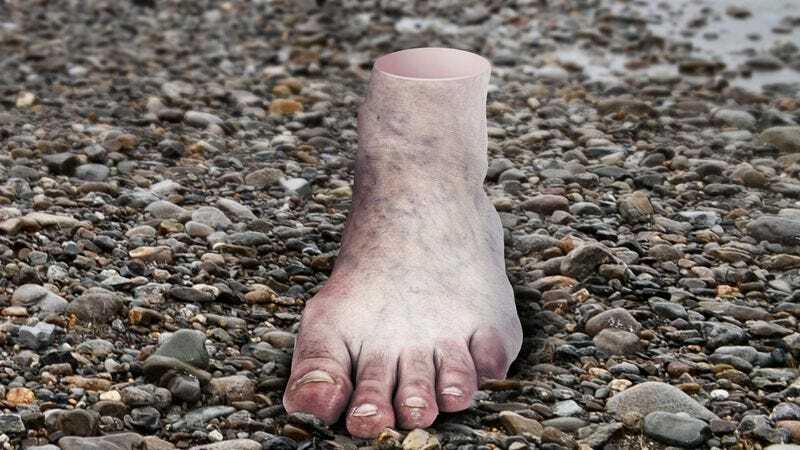 Further down the Wormhole: Five of the feet have washed up in Washington state, but the remainder were discovered in British Columbia. Canada’s westernmost province is home to 4 million people and roughly as many American TV-show filming locations. BC’s coast is also a port of call for many cruise ships, which Wikipedia groups together in a very broad “modern merchant ships” category alongside narco-submarines, often handmade custom vehicles used for smuggling drugs undetected by the authorities. We’ll dive into that subject next week.